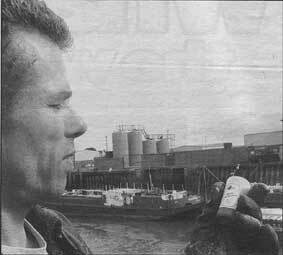 DUTCH artist Arnold Schalks is busy filling bottles with water from the River Humber as part of the Art In the Open '99 event. Arnold, of Rotterdam, was invited to take part in the event by Quay Art in Hull. The aim of his work, which is entitled Both Ends Meet, is to emphasise the effect of global warming. After filling the bottles, they are given to Quay Art visitors to take away and put in freezers at their homes. By doing this, they are participating in Anglo-Dutch solidarity against the effect of Global warming that the artist believes will affect both Hull and Rotterdam - that is, rising water levels. Visitors then fill out a certificate to show they have taken part. The artist will send these to Queen Beatrice of the Netherlands. Arnold will be at Quay Art until tomorrow from 12pm to 4pm. Art in the Open '99 is funded by the National Lottery via Quay Art. It is the third year of the visual arts extravaganza which aims to bring art to a new audience.